Carcinoma A carcinoma is a cancer of one of the cells that line the inner or outer surfaces of the body. All skin cancers are carcinomas. Other sorts of cancer include cancers of deep tissues like muscle, bone and cartilage (called sarcomas) and cancers of the blood cells (eg. leukemia). Cryotherapy Cryotherapy, often called cryo, is the treatment of lesions with a cold substance. At Queensland Sun, we use liquid nitrogen spray (-196 C). Cryo is an option for most sunspots and selected early skin cancers. Early skin cancers treated in this way are often debulked (scooped out) first (see curettage). Curettage Curettage is the act of scooping out a lesion with a spoon-like instrument (called a curette) as part of the treatment process. Dermatoscope A dermatoscope is a device that gives a magnified view of the skin free of surface reflections. 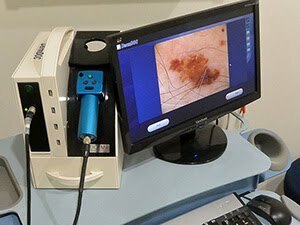 Dermatoscopy is mainly used to closely examine irregular pigmented lesions to diagnose melanomas. Digital dermatoscopy is the recording of digital images taken from a dermatoscope to assess changes in pigmented spots over time (see Fig 1). Dysplastic Nevus A dysplastic nevus is a large and irregular benign mole. They need to be inspected closely to make sure that they are not a melanoma. Most do not turn into a melanoma, but if they are changing in appearance, they are best removed. 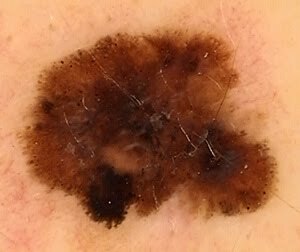 People with multiple dysplastic moles are at a greater risk of developing melanoma elsewhere on their body and need regular checks. Excisional Biopsy A procedure where an entire lesion is removed and sent for testing, without sampling it first. IEC Intraepidermal Carcinoma. This is an SCC that hasn't invaded yet ie. a non-invasive SCC. Also known as Bowen's disease. IEC treatment options include efudix, cryotherapy (with or without curettage) and excision. Incisional Biopsy A procedure where part of a lesion is removed and sent for testing to determine the appropriate treatment. If the entire lesion is removed and sent for testing, this is called an excisional biopsy. Level 1 Melanoma Level 1 means that it has not invaded at all yet. Level 1 melanomas are treated with simple excision and rarely cause further problems. If left untreated, they will eventually start to invade and spread. Melanoma-in-situ A melanoma-in-situ or insitu-melanoma is a level 1 melanoma. Metastasis Metastasis is the spread of cancers to areas away from the original site e.g. a melanoma on the arm spreading up to the glands in the armpit. Non Melanoma Skin Cancer Also known as NMSC. Melanomas are significantly more dangerous than other skin cancers. As a result, skin cancers are often classified as either melanomas and non-melanomas. The 2 most common NMSC's are the BCC and the SCC. In Situ Means “on site” or “in place”. When describing skin cancers, it means they haven’t moved yet ie. they haven’t invaded yet. Skin Flap Skin flap surgery is a reconstructive technique where skin with an intact blood supply is moved to another site to repair a defect. Superficial BCC A superficial BCC is a BCC that has not yet invaded into the skin. It appears as a red-pink flat lesion, often mistaken for dermatitis. Treatment options include aldara, cryotherapy and excision. Fig 2. Melanoma as appears with a dermatoscope. Fig 3. Efudix. Common and effective treatment for sunspots.